Tablets are getting thinner and thinner, and the end result is bound to be tablets that are paper thin. We're almost there—but there's still a question of exactly how handy that'll really be. 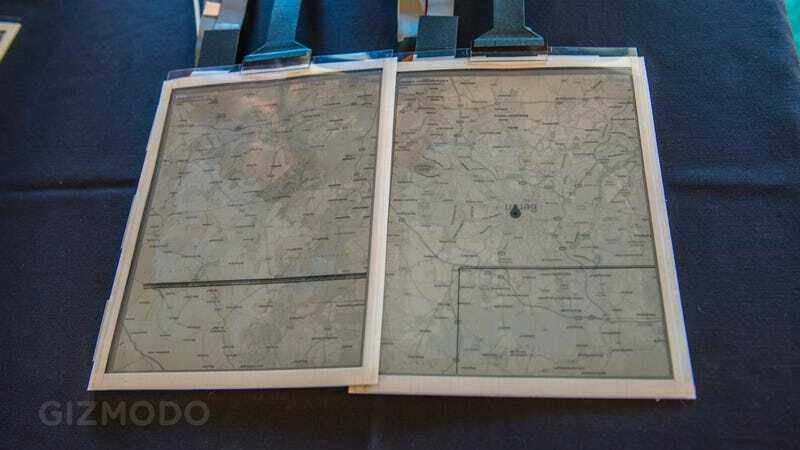 A flexible, paper-thin E Ink display, Plastic Logic's "Paper Tab"—developed in partnership with Intel and Queen's University in Ontario, Canada—is a glance into that future. But there's a catch—it's a far-flung idea. The displays may be paper thin—well, cardstock thin, for now—but we're only talking about the displays. Each prototype still needs to be tethered to a CPU. The rest of the components, like processor and battery, are still unfortunately rigid. For the time being anyway. If the "tablets" were to take off, Plastic Logic imagines a future where individuals would own as many as 9 or 10 of the theoretically dirt-cheap, machine-printed sheets. All their positions would be networked over Wi-Fi, and each would be pretty much devoted to a single purpose, like email or reading. It'd be the opposite of an all-in-one future. The devices by Plastic Logic not have touchscreens. Instead, they're opperated by a series of bends. Thanks to the location monitoring, you could emulate a sort of NFC-like data transfer by rubbing the tabs against each other. It's cool, but it probably doesn't make you want to ditch your iPad or Kindle. Because workable, untethered flexible E Ink tablets are a way off, the tech is far more likely to pop up as E Ink product labeling. Other possible scenarios include watches, where a surface is curved, but there are still rigid places to stash the rest of the unbendable components. And sure, that could be pretty neat, but that's about it. For now anyway.